With Arnie sitting on the roof again and a bright, Spring afternoon ahead, Hoppers were looking to avenge the overwhelming defeat they suffered at Leicester Road in November. Hinckley made ten changes to the side that took the field that day which may have contributed to their very different performance in this fixture. The Hornets kicked off deep into the Hoppers’ half but immediately found themselves back on the half way line defending a penalty. Tom Davidson found touch just short of the 22 and from the lineout Hoppers were awarded another penalty which he stroked through the posts for a 3-0 lead after just four minutes. Hoppers had much of the possession for the next ten minutes but Hinckley stuck to their task and despite being driven in their own scrum, kept the ball and began their own attack on their hosts’ 22. They pressed the Hoppers defence back and forth across the field and with a procession of scrums and lineouts little progress was made by either side. Hinckley had their first chance when, from a clearing kick, centre Hough broke down the left hand side and looked home and dry until he was brought down by a solid tackle from Tyler Spence defending alone on his wing. Whilst they were denied the score, Hinckley were still on the attack and a nicely weighted cross-field kick was collected by full back Wilson who crossed the line with ease and then converted his own try to put the visitors in the lead 3-7. Hoppers had now had the wake-up call and set about an assault which resulted in two tries in as many minutes when firstly Matt Lamprey charged through the defence for his try which Davidson slotted with ease and then, picking up a loose ball on his own 10m line, Spence outstripped the opposition to score the first of his three tries of the afternoon. The conversion slipped past the upright but with ten minutes to half time, Hoppers were back in the driving seat at 15-7. The Hornets had a chance to claw back some points with a penalty on the Hoppers’ 10m line in front of the posts but, even though for the first time this year there was no wind at all, the ball refused to part the uprights. With the clock moving into the red Hoppers turned the screw further with a classic backs’ try. Lamprey started the move as he passed the ball to Ryan Carlson. It then flowed through from Davidson to Sam Stott, to Alex Hurst, on to Scott Jordan who passed to Spence for his second try. The conversion missed but at half time the score stood at 20-7. The half had been a fairly even, low key affair for much of the time. Hinckley had had their share of the ball but could not get through the Preston defence. 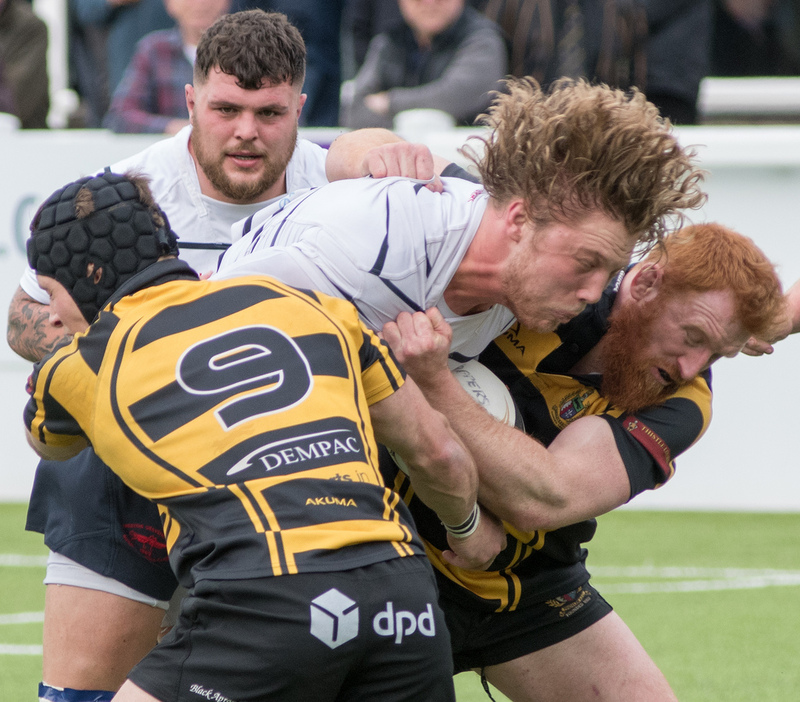 Hoppers were stronger in their attacks and had driven the few scrums awarded in the half but once again the frequent penalties they incurred had disrupted the flow of the game. The second half started with a kick deep into the Hornets’ half where the Hoppers’ forwards maintained a series of attacks inside the 22. Hinckley managed to clear and were awarded a scrum on their own 10m line. They collected the ball and were starting towards the half way line when a pass was intercepted by Hurst who then sped through the defence to score the bonus-point try under the posts. With an easy conversion from Davidson, Hoppers extended their lead to twenty points. No sooner had Hinckley restarted the game when they found themselves even further adrift as Matt Crow took his turn to cross the whitewash for the fifth Hoppers’ try. Davidson converted and trotted back into position just in time to greet his brother, Will, making his debut from the bench at centre as a replacement for Sam Stott. As play resumed Hoppers were dominant and a break by Carlson took him deep into the visitors’ territory where only a desperate tackle denied a further score. Hoppers were then denied more chances when Scott Jordan twice broke through the line only to see his first chip run out behind the goal and his second take an evil bounce away from his grasp. The game then opened up and play moved from end to end as pressure was applied by both teams. Hurst was shown a yellow card on fifty-seven minutes for a tackle that was deemed to be high. Hinckley then attacked from the penalty and Wheatcroft scored wide of the post. Hoppers were unfazed and just three minutes later Ollie Trippier collected the ball and, making ground into the opposition half, he passed to the flying Spence who raced over the line for this hat-trick-try. Davidson made sure of the extras and the score moved on to 41-12. Hinckley were still not done and from a series of scrappy handling moves launched a cross-field kick which was collected by Hough for an easy dot down. Wilson converted and the Hornets shortened the lead to twenty two points. Any relief they felt from the try was short-lived as the restart took Hoppers into the Hinckley 22 and a penalty. Davidson found touch on the 5m line and from the lineout Dan Madden burst over for the seventh Hoppers’ try. The conversion was good and the match finished with Hoppers pressing the Hinckley line with a break by Alex Jobson who was only stopped by some dogged defence. With this, the sixth win on the trot, it was a very happy Coach who spoke after the match. ‘At half time I thought we had been a bit lucky. We had breakaway tries but we didn’t perform well through trying to force the play too much. I felt that at half time some strong words were needed to get the lads focussed and they played really well in the second half. Everyone on the squad got at least thirty minutes and there were some significant individual performances, Tyler’s hat-trick in particular. It was good to see Dan get a try and Will made an excellent debut from the bench. Hull Ionians have been top of the league table for most of the season and have ninety-five points. They will be a tough side to face on their own turf but, despite their apparent dominance, they can be beaten and our team, as we know, are capable of dealing with any side in the league. A supporters’ coach is going to the match and as usual, your support means a great deal to the players.